We felt that our second issue of Big Bang at Image Comics was another very strong one. 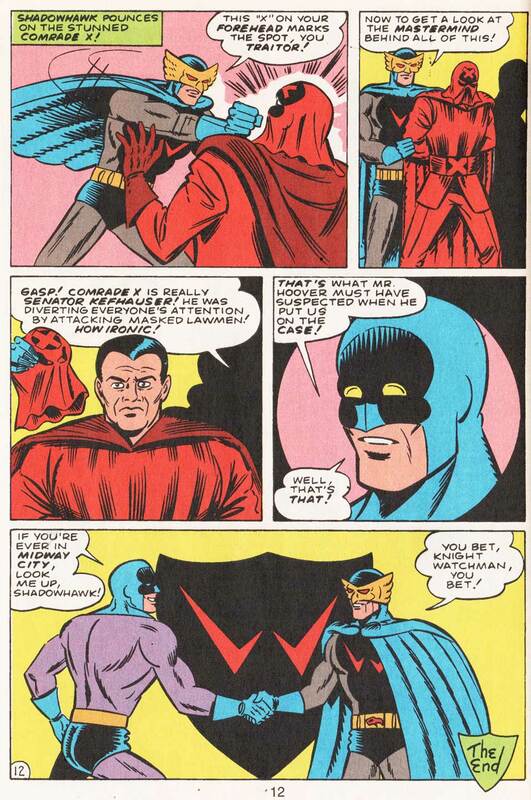 It featured our flagship character, the Knight Watchman, guest-starred Jim Valentino’s Silver Age Shadowhawk, contained a Golden Age era Badge story with Mark Lewis’ wonderful Simon & Kirby homaged artwork, and concluded with a short Dr. Weird prose story written by Ed DeGeorge. 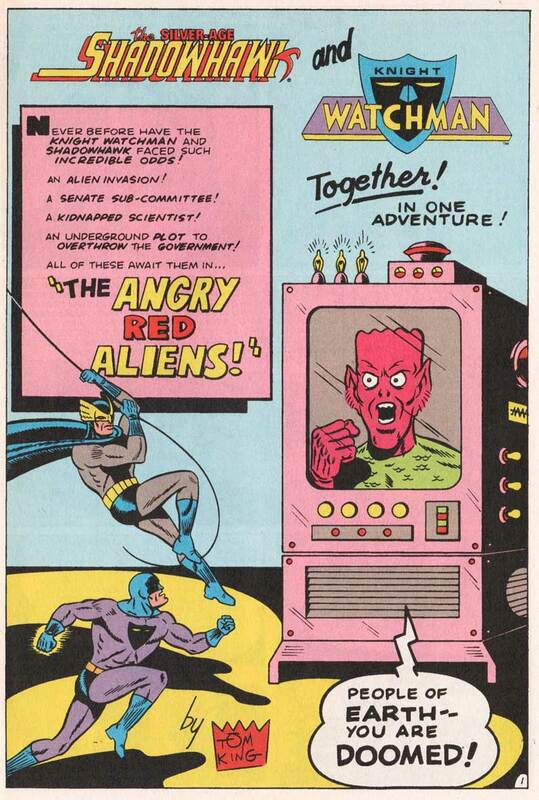 All of that PLUS a back cover pin-up of the Beacon by Golden Age legend Mart Nodell, creator of the Green Lantern! 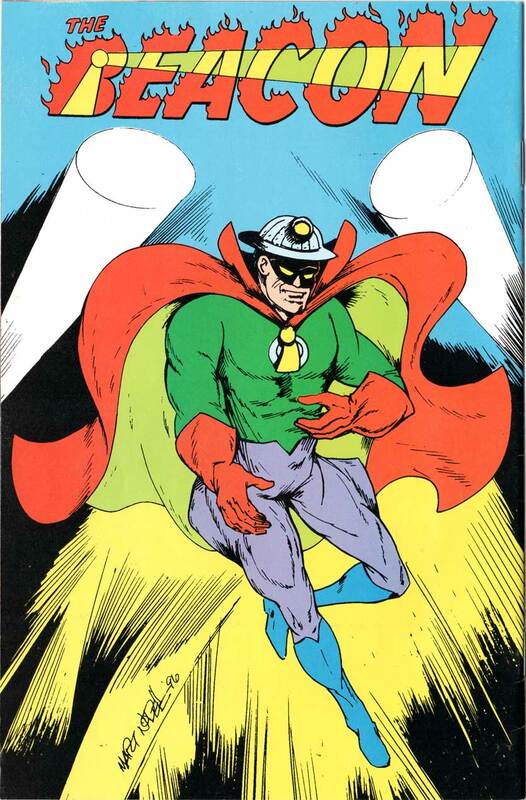 “I don’t really remember whose idea it was to do a Big Bang Comics story combining Knight Watchman and Silver Age Shadowhawk, but it was probably Jim Valentino’s. Jim had always been an enthusiastic Big Bang supporter and I had previously drawn a modern Shadowhawk trading card in the Tom King style at Jim’s request. He had already toyed with the Silver Age Shadowhawk and published some stories as I recall when we came on board at Image. Jim drew a Silver Age Shadowhawk/Knight Watchman pin up page in the style of a Bob Kane Golden Age Batman cover and sent it to me for inking. Looking back, I don’t think Jim really imposed many (if any) rules on the use of Silver Age Shadowhawk and Squirrel (SSH’s son & sidekick), but I knew better than to add anything substantive to the continuity or mythos. I wanted to use only the major characters of Knight Watchman and Silver Age Shadowhawk as equals, and I knew I didn’t want to have the sidekicks getting in the way. I also knew that I wanted to set the story in the 1950s and use a thinly veiled Red Scare of that era as a tent pole for the story. I figured the 50s entertainment was full of alien invasions, communist sleepers, the FBI as authoritarian heroes, and newly televised Government processes. Let me digress for a moment to give a little creative insight for me in general, and this story specifically. As an infant of the late 50s and a child of the early 60s, my view of “comic book” Superheroes was informed by what I saw on TV. That is to say, MY Flash Gordon was Buster Crabbe, MY Superman was George Reeves, MY Batman was Adam West. Because I viewed the live action series first, then discovered the print versions, in MY mind, the comic books and the newspaper strips were reflections of THEM, not the other way around. Consequently, when I create comics, I see and hear those voices, see those images, feel that atmosphere—in my mind, and try to translate that to the page. 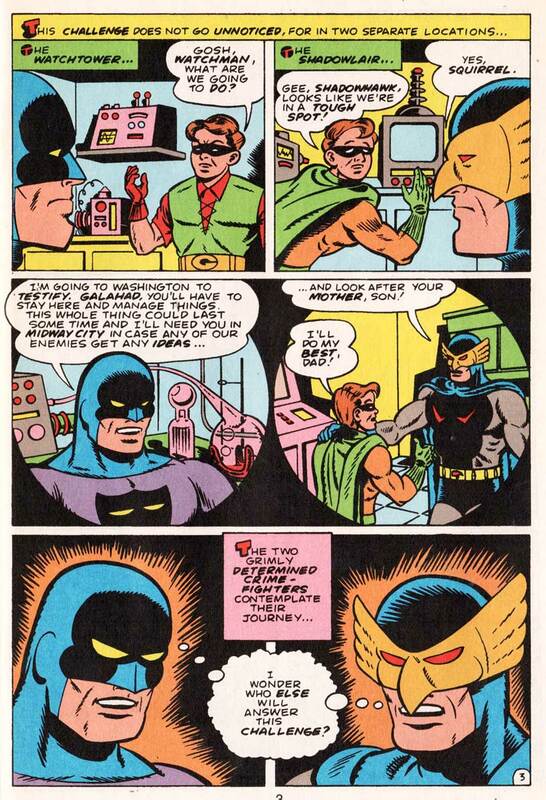 Anyway…I decided that in this story, both Knight Watchman and Silver Age Shadowhawk were publicly known and welcomed as independent crime fighters of the highest caliber. The threat would appear to be of alien origin, but in reality would be Earthbound and of a sinister anti-American nature. Our heroes would each independently volunteer to help, and the FBI would be involved. 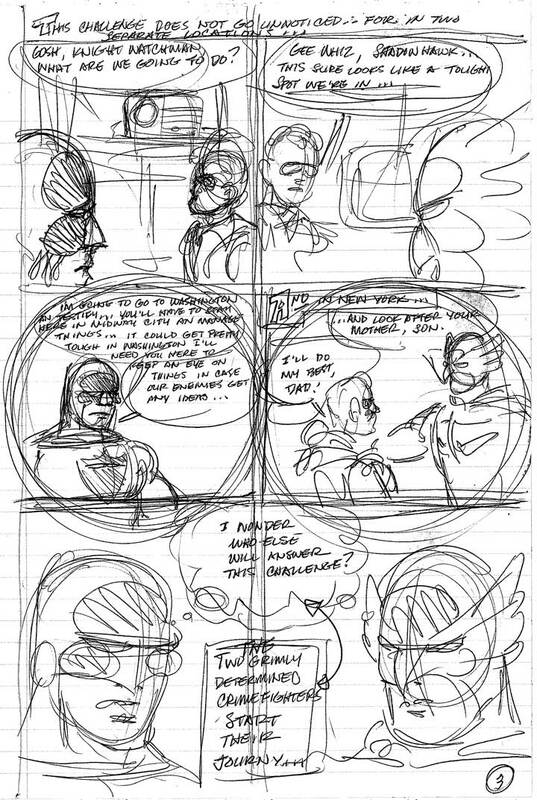 As I usually do, I added personal touches like having the congressional hearings on Superhero activities in the story presided over by creator friends of mine; Larry Marder, Donald Simpson, and Jim Valentino, who surround the secret villain of the piece, Senator Keefhouser. The kidnapped scientific genius, who is also the Knight Watchman’s inventive confidant, is a caricature of one of my favorite creators, Will Eisner, known in this story as Igor Eisner. 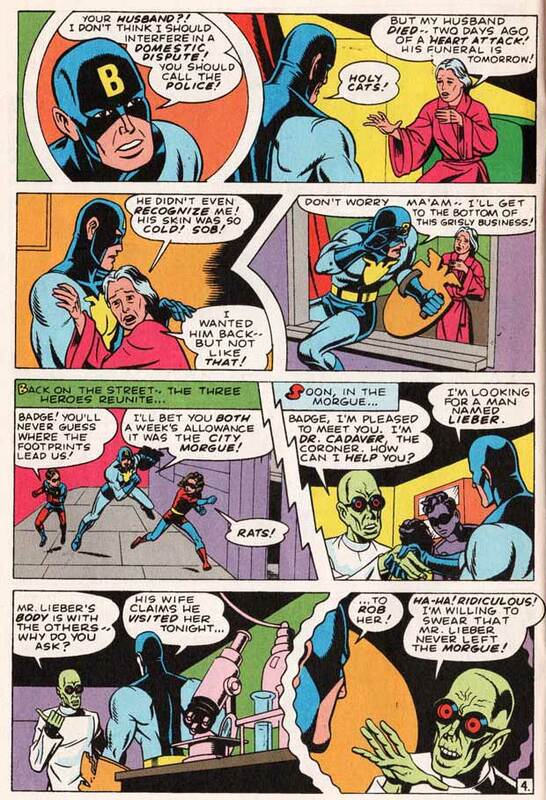 Eisner creates a bogus circuit board as a clue that he hopes Knight Watchman will eventually find and decipher. Thanks Chris. 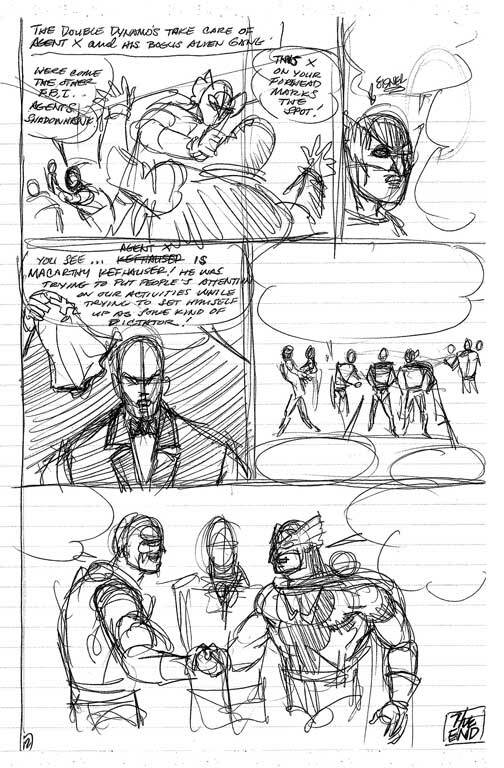 Shown above are two of the pages from his roughs to finals. The other featured story in this issue was The Zombie Crime Boss, starring the Badge and his young Rookies (Trooper and Bobbie). The villain of the piece was Dr. Cadaver (created by David Easter) – the city’s coroner who aimed to become the city’s new crime boss by reanimating corpses in the morgue and sending them out to commit crimes. Cadaver was tripped up in the story by one of his zombies – – the infamous Public Enemy #1 – Louie “Scarface” Provalone, who had been executed earlier that evening. But Scarface didn’t take orders from anybody and filled Dr. Cadaver full of lead. This story was written by myself and inked by Jeff Meyer, but Mark Lewis’ pencils are the star of this one. I love all of the work Mark did for Big Bang over the years, but his Joe Simon/Jack Kirby stories are my favorites. 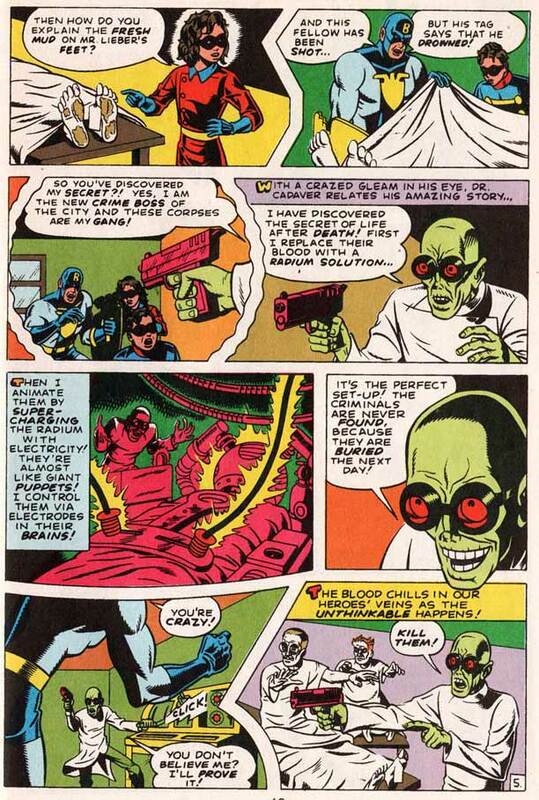 Last but not least was the Dr. Weird story, Creatures of the Night. It is a powerful little tale that pitted the Golden Ghost against a demonic Changeling that had replaced a young boy in his parent’s own house, and the dramatic rescue from the nether dimension where the boy was trapped.